two number lines in a plane drawn perpendicular to each other. x-axis - the horizontal axis is called the x-axis. y-axis - the vertical axis is called the y-axis. Origin - the point of intersection of the two axes is called the origin. 1. Determine whether the following ordered pairs are solutions of the equation y = -2x + 5. 2. Graph y = 2x. 3. Graph y = 1/2x + 3. •The above graphs are called linear because they are straight lines. •Any equation whose graph is a straight line is called a linear equation. nonlinear equations is to be sure to plot enough points so we can be sure of what it will look like. 1. Graph y = x2-1. 2. Graph y = 2/x . 3. Graph y = |x| + 1.
between the number of hours driven with the distance travelled? •The set of all possible times driven is called the domain. one element in the range. EX 6. Consider the following. Definition 5. 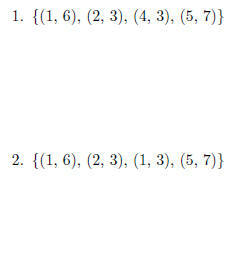 A function is a set of ordered pairs in which no first coordinate is repeated. of the real numbers. For such functions we can graph them on the cartesian coordinate system. The graph of a function is the graph of its set of ordered pairs. cannot be drawn to intersect the graph at more than one point, the graph represents a function. than one point, it is not a function. If we can't, it is a function. determine the domain and range of each function or relation. f(x) read as "f of x"
Warning: This is NOT multiplication. •Notice that the value of y depends on x. •If we plug in a value for x we get a value for y, different values of x give different values of x. •We say that y is a function of x.
explicitly states that the value depends on x. •We will use both notations interchangeably. function and our independent variable. For example g(x), h(x), P(t), etc. . .
EX 10. We also will evaluate functions with this notation. 3. An application: The Celsius temperature, C, is a function of the Fahrenheit temperature, F.